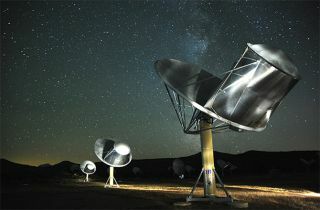 The SETI Institute's Allen Telescope Array in Northern California searches for radio signals that could have been generated by intelligent alien life. The search for signs of life in a mysterious star system hypothesized to potentially harbor an "alien megastructure" is now underway. Astronomers have begun using the Allen Telescope Array (ATA), a system of radio dishes about 300 miles (483 kilometers) northeast of San Francisco, to hunt for signals coming from the vicinity of KIC 8462852, a star that lies 1,500 light-years from Earth. The leading hypothesis at the moment involves a swarm of comets that may have been sent careening toward KIC 8462852, possibly after a gravitational jostle by a passing star. But it's also possible, astronomers say, that the signal Kepler saw was caused by huge structures built by an alien civilization — say, a giant assortment of orbiting solar panels. That latter possibility, remote though it may be, has put KIC 8462852 in the crosshairs of scientists who hunt for signals that may have been generated by intelligent aliens. "We are looking at it with the Allen Telescope Array," said Seth Shostak, a senior astronomer at the SETI (Search for Extraterrestrial Intelligence) Institute in Mountain View, California. "No problem with that; I think we ought to, for sure," Shostak told Space.com. But, he added, people "should perhaps moderate their enthusiasm with the lessons of history." Shostak cited the example of pulsars, fast-spinning, superdense stellar corpses that emit beams of high-energy radiation. These beams are picked up by instruments on and around Earth as regular pulses, because they can only be detected when they're fired straight at the planet (an event that occurs at predictable intervals because of pulsars' rotation). Astronomers know all this now. But in the 1960s, when the first pulsar signals were discovered, some scientists interpreted them as possible alien transmissions. "So history suggests we're going to find an explanation for this that doesn't involve Klingons, if you will," Shostak said of the KIC 8462852 mystery. But until such an explanation is found, the intelligent-aliens hypothesis will still be on the table, even if the ATA and other instruments like it come up empty. The lack of a detectable signal, after all, does not establish that KIC 8462852 is a lifeless system. The star may support lifeforms that do not emit signals we can pick up, for example. Or it may once have hosted a civilization that has since gone extinct, leaving the strange megastructure as a sort of monument. Kepler's main planet-hunting work suggests that the Milky Way galaxy teems with billions of rocky, potentially habitable planets. So KIC 8462852 is far from the only lead that Shostak and his colleagues will be chasing down in the coming years. "It almost doesn’t matter where you point your telescope, because there are planets everywhere," Shostak said. "If there's somebody out there, there are going to be so many of them out there that I do think there's a chance."